It's the start of another work week and I'm pretty jealous that my two roommates have the day off. Both of them are New York Teaching Fellows, one teaches first grade and the other teaches tenth, so they have off today and tomorrow for Rosh Hashanah. I'm just glad I love being at work, although waking up on Mondays is always rough. Your new layout is cutteee!! 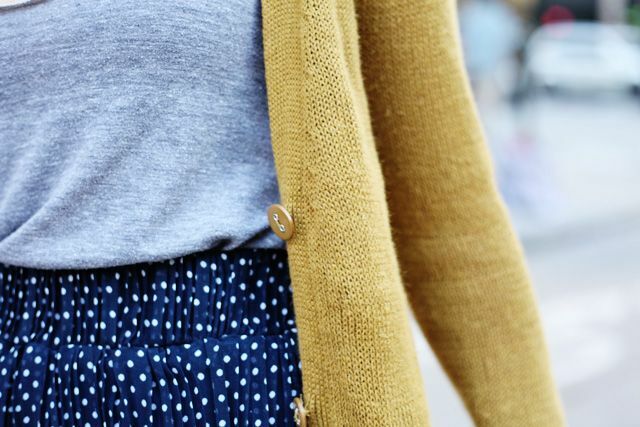 That cardigan is to die for and now I want to pair my mustards with polka dots! Fall... hurry. Also, I love your new layout. It's cute!! Cool layout! You're very internet savvy. You should own all the interwebz!